Apnea of prematurity (AOP) is defined as cessation of breathing for more than 20 second, accompanied by oxygen desaturation of ≤80% for 4 second or more, and/or bradycardia of heart rate < 2/3 of the baseline for more than or equal to 4 second. It is a developmental disorder usually reflects a “physiological” immaturity of respiratory control. Nevertheless, neonatal diseases may play an additive role resulting in an increased incidence of apnea. Methylxanthines (theophylline and aminophylline) have been used in the treatment of apnea of prematurity. However, the introduction of a preservative-free parenteral caffeine citrate product onto the market resulted in a move to caffeine as the drug of choice. Over the years, available evidence shows that caffeine is one of the most effective treatments in reduction of AOP. Several clinical trials have demonstrated the efficacy of caffeine in reducing apneic episodes and reducing the need for mechanical ventilation in preterm neonates. Although the mechanism of action of caffeine in apnea of prematurity is not known, several mechanisms have been hypothesized. These include the following: stimulation of the respiratory center, increase minute ventilation, decrease threshold to hypercapnia, increase skeletal muscle tone, enhance diaphragmatic activity, increase metabolic rate, and increase oxygen consumption. Literature indicates multiple benefits associated with preterm neonatal caffeine therapy. The international, randomized, placebo-controlled caffeine for apnea of prematurity trial has shown that caffeine therapy reduces the duration of exposure to positive airway pressure and supplemental oxygen and reduces the rates of neonatal morbidities including bronchopulmonary dysplasia and severe retinopathy of prematurity (ROP) (Stage 4 or 5). The overall frequency of ROP did not significantly differ between neonates who received caffeine and those who did not, however, severe eye disease was less common in caffeine-treated neonates. There was a significant reduction in the number of neonates requiring the pharmacological closure of PDA or surgical closure of persistent PDA in the caffeine-treated neonates. Caffeine therapy improves the rate of survival without neurodevelopmental impairment at the age of 18–21 months and reduces the rate of developmental coordination disorder at 5 years of age as there is evidence of an improvement in gross motor function with better motor coordination and visual perception. Furthermore, it was found to be associated with a reduced risk of motor impairment in 11-year-old children with very low birth weight. The advancements and progress in the neonatal intensive care with the significant evolution in our understanding of neonatal respiratory rhythm generation raised questions regarding the optimal approach of neonate with apnea of prematurity. Several studies have been conducted over the past years where they focused on the implications of caffeine. The variation in caffeine therapy practice in the management of apnea of prematurity addresses certain gaps in the treatment decisions, and the impact of it considered in this study. The aim of this study is to examine the current management practice of apnea of prematurity and to assess the variation in the caffeine therapy use, exploring the physician's management preferences and describing the rationale for their treatment decisions. A standardized, English survey consists of 23 items was sent electronically by E-mail to neonatologists and pediatric physicians within the Saudi Neonatology Society database, physicians who are caring for premature infants and those who are directly involved in the decision process of treating newborns across hospitals in Saudi Arabia. The survey is structured into two parts. Part one provides an overview of the demographic characteristics of survey respondents including position, years of experience, area of practice, and the region. Part two includes the questions related to caffeine use, type, dose, indication, clinical thresholds for caffeine initiation, side effect, monitoring, and treatment decisions that are used in managing a preterm neonate with apnea. The survey was designed using multiple-choice format, and “other” was included in most multiple-choice items with specification encouraged and allowing to select one or more options from a list of answers. The survey questions were formulated using closed-ended questions and partially closed questions in a way to gather information in regard to caffeine therapy reflecting the physician experience and not to limit the answers. Physicians were asked to answer the questions based on their background knowledge, clinical practice, experience, their preferences, and perceptions of the importance of potential treatments. A second E-mail was sent approximately 2 weeks after the initial E-mail to remind the nonrespondents to complete the survey. Subjects did not receive incentive for participation, and they were informed in the cover letter that participation in the study is voluntary and that individual response would be confidential. The survey questions were constructed from the existing literature and published studies that address certain gaps, unsolved issues, and variation in practice in regards to caffeine therapy use in neonates for the management of apnea of prematurity. To promote efficiency in conducting our survey, a pilot survey was performed testing the validity of the survey and the appropriateness of questions to the targeted population. A group of pediatricians and neonatologist participated in a pilot study of the survey and reviewed the questions before the survey was finalized and distributed. Adjustment, if needed, was made on the basis of their feedback. All the statistical analyses of data are done using the software package SAS version 9.4 (SAS Institute Inc., Cary, NC, USA). Descriptive statistics for the continuous variables are reported as a mean ± standard deviation, and categorical variables are summarized as frequencies and percentages. This study is based on information gathered by the team from healthcare professionals (pediatricians and neonatologist) after an informed consent was obtained. All information is regarded as highly confidential, no personal identifying information recorded in the data collection forms or on the publication itself. Participation in this study is completely voluntary. The Institutional Research Ethics Committee approval was obtained. The survey was distributed to 147 physicians, and responses received from 78 physicians (53%). The demographic characteristics of the survey respondents are shown in [Table 1]. 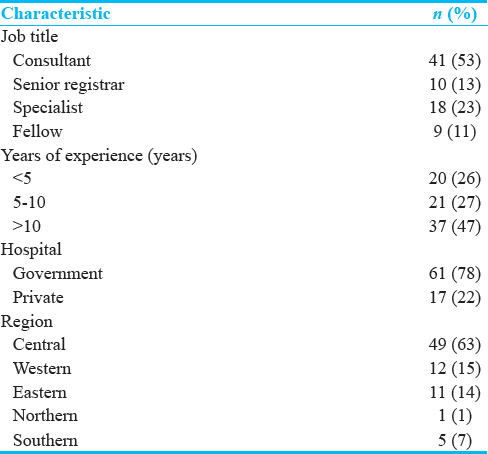 About half of the respondents were consultant (52%). About 74% have more than 5 years of professional experience, while 47% have more than 10 years of experience. About 78% worked in government hospitals, and 22% worked in private hospitals. Geographically, Saudi Arabia is divided into five regions. The majority of the survey respondents were from the central region (63%). Overall, all respondents indicate that they are using caffeine for the management of apnea of prematurity. Caffeine citrate is the predominantly used form of caffeine that pointed out by 90% of respondents. Aminophylline (27%) followed by theophylline (10%) are the most commonly used medications in the management of apnea of prematurity other than caffeine. Both prevention and treatment of apnea of prematurity are considered the main indication for starting caffeine therapy (87%). Other considerable clinical indication was the facilitation of extubation (33%). 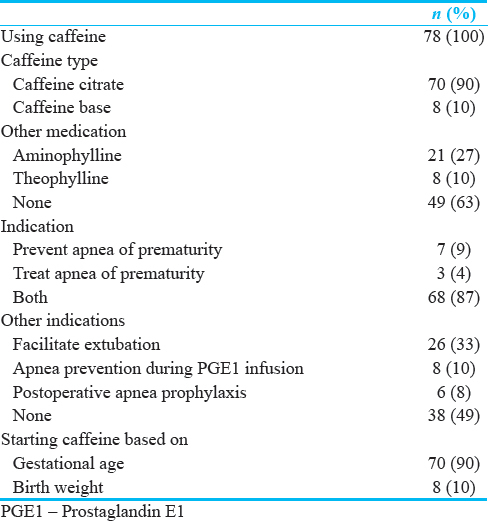 The main criteria influencing the decision to start caffeine therapy for the management of apnea of prematurity is the gestational age at birth (90%), and the mean gestational age for starting caffeine therapy is 31.5 weeks as marked by the respondents [Table 2]. The majority of the respondent is not measuring serum drug concentration (84%), while 6% measuring it routinely and 10% measuring it only if toxicity is suspected. Patient's clinical condition and response to therapy are the main indications to increase caffeine dose as selected by 44% of the respondents. About 60% of respondents selected not to increase the maintenance dose if clinically stable and to allow the patient to outgrow the dose but 36% of the respondents will increase the dose according to changes in body weight. If apnea persists while on maintenance caffeine 53% of the respondents will increase the caffeine dose to a maximum of 10 mg/kg/dose, 36% will give loading dose and continue on the same maintenance dose. Most of the respondents (77%) decided to switch from intravenous to peroral (PO) once the patient reached full feed, fewer (23%) will switch to PO once the feed reached 120 ml/kg/day without any dose adjustment as agreed by 80% of the respondent. No dose adjustment required in renal or hepatic impairment reported by 76% of respondents. Withholding caffeine is anticipated by 69% of respondent if there is tachycardia with heart rate >180 bpm and 15% are withholding it if the patient showed sign and symptoms of feed intolerance [Table 3]. 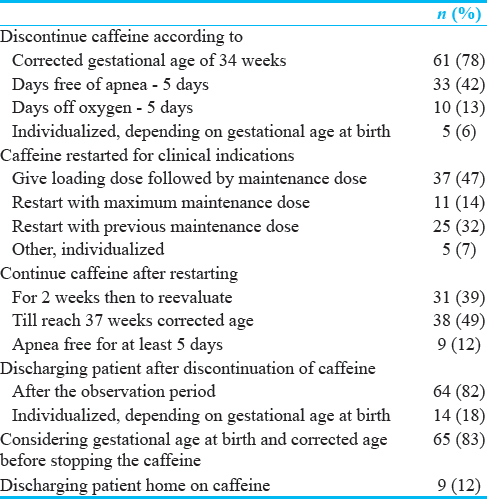 Discontinuing caffeine therapy is based on the corrected gestational age (78%), mostly at 34 weeks (mean 34.2 weeks [95% confidence interval [CI] 34–34.3]), other 42) will discontinue caffeine if patient free of apnea for a mean of 6.1 days ([95% CI 5.0–7.2]), (13%) if patient is off oxygen for at least 2 days, few (6%) answered that it is individualized depending on gestational age at birth, the more preterm the baby, the more time needed to stop caffeine, as caffeine might be continued until 44 corrected age. If caffeine restarted for clinical indication, 47% of the respondent will give loading dose of caffeine followed by the maintenance dose, (32%) will restart caffeine with the previous maintenance dose and 14% will restart caffeine with maximum maintenance dose. Once caffeine restarted, it will be continued till reaching 37 weeks corrected gestational age (49%), 39% will continue caffeine for 2 weeks then they will evaluate, and accordingly, they will decide to stop or continue the medication. Discharging patient after discontinuation of caffeine therapy generally occurs after an observation period of 5 days (82%) (mean 4.5 days [95% CI 4.2–4.9]), while 18% stated that it is individualized depending on the gestational age at birth. About 88% of respondents are not discharging patient home on caffeine [Table 4]. 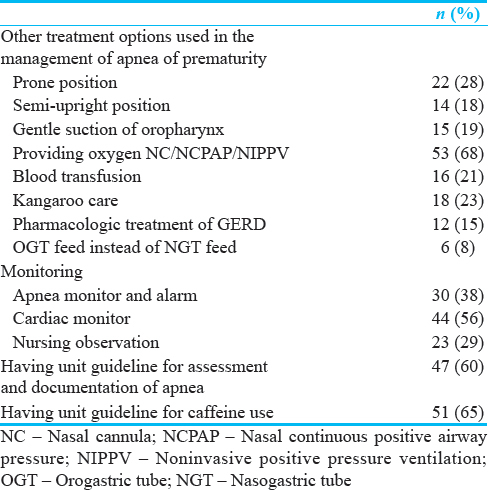 Other forms of treatment used in the management of apnea of prematurity were providing oxygen either through nasal cannula or noninvasive ventilation (68%), prone position (28%), Kangaroo care (23%), blood transfusion (21%), and pharmacologic treatment of gastroesophageal reflux disease with anti-reflux medication (15%). In-hospital monitoring of the neonate for apnea is done by applying cardiac monitor (56%), using apnea monitor and alarm (38%), and through nursing observation (29%). About 60% of the respondents have a unit guideline for assessment, documentation, and reporting of apnea events, and 65% have a unit guideline and protocol for caffeine use [Table 5]. In this study, we collected data on caffeine use in the management of apnea of prematurity across the Kingdom of Saudi Arabia. Around half of the respondents were consultants which empower the results of our survey. Most of them had more than 5 years of professional experience and around half of all had more than 10 years of experience. The greater the experience, the greater the depth of understanding of knowledge application that gives more credibility to the answers with selection of the most relevant option, and it provides a strong impact on the reliability of the measured values. Aminophylline and theophylline are other medications used in the management of apnea of prematurity. Comparative studies have found similar efficacy for theophylline and caffeine in the control of apnea of prematurity. However, caffeine has several advantages over theophylline including a wider therapeutic index, and it has been proven to be safe, better tolerated, and cost-effective. Adverse effects, such as tachycardia and feeding intolerance, are reported more frequently with theophylline than with caffeine. The prolonged half-life of caffeine results in less plasma level fluctuations and thus routine measurement of serum caffeine levels have not been shown to be necessary. It was found that serum drug levels in studies associated with clinical benefits ranged from 5 to 25 mg/L, and the critical threshold for serious toxicity with caffeine therapy is >50 mg/L. Furthermore, the optimal dosing providing therapeutic plasma caffeine concentration is essential to avoid subtherapeutic or toxic concentrations. It was shown in our results that most of the respondents are not measuring serum drug concentration routinely. The widely used dosing regimen is a loading dose of 20 mg/kg followed by a maintenance dose of 5 mg/kg/day which will maintain plasma caffeine concentrations in the therapeutic range. The maintenance dose could be adjusted for changes in body weight; however, the majority of physicians would allow the neonate on caffeine to outgrow the dose naturally if clinically stable. A similar practice was applied in most of the units as seen in our results. If apnea persists despite the treatment, the daily maintenance dose can be increased to a maximum of 10 mg/kg/day. Half of the respondents are following the same recommendation. Caffeine citrate can be administered either by intravenous or by the oral route and whether a neonate can take oral caffeine depends on the neonate feeding ability. Once patient tolerates full enteral feeding caffeine can be given orally without the need of any dose adjustment. Comparable pattern of practice seen in our study. Although caffeine citrate administration is generally considered safe, it does occasionally present with adverse effects leading to change in dosing or withholding the treatment. Tachycardia accounts for the highest overall response in our survey in which the respondents believed that the drug must be withhold if the caffeine causes the heart rate to increase more than 180 bpm and this is consistent with several studies. In clinical practice, preterm infants, who failed to successfully wean off caffeine therapy and were identified as having apnea after stopping caffeine, were restarted on caffeine with either a maintenance dose or a half loading dose followed by the maintenance dose, depending on the time interval from stopping caffeine citrate to recurrence of apnea. Consequently, caffeine therapy may need to be continued for an additional 2 weeks based on the clinical response to therapy or until the preterm infant approach a term equivalent age or reached a corrected gestational age of 37 weeks and beyond as this limit may, however, could be revised according to clinical judgment in individual cases depending on the response to treatment. To discharge premature infants, they need to attain both medical stability and reach physiologic milestones (specifically, independent thermoregulation, control of breathing, and the ability to feed by mouth and gain weight) before safe discharge to home. Infants who have attained physiologic maturity and those who were on caffeine should be observed several days in hospital before being discharged, due to the extended half-life of caffeine. Accordingly, there is a variation in the discharge periods related to safe apnea free periods, as caffeine level may not reach subtherapeutic concentrations until several days;, therefore, the exact definition of clinically significant apnea and bradycardia with precise documentation is crucial. Understanding the long therapeutic half-life of caffeine necessitates appropriate surveillance and close monitoring of the preterm infants for recurrence of apnea after cessation of caffeine therapy. The duration of apnea-free period required before hospital discharge would influence the length of hospital stay and timing of discharge. The extent of the observation period that would anticipate the timing of hospital discharge is debated. The duration of at least 5 days was reported by several studies which are comparable to our study, as most of our participants considering discharging patient home after an observation period of 5 days from the discontinuation of caffeine. Data indicate that extreme preterm infants, especially those below 26 weeks of gestation, may continue to have apnea beyond term gestation and needed longer observation period of least 7 days before discharge. Darnall RA et al. defined the required margin of safety regarding the minimum safe duration of an apnea-free period before discharge and concluded that infants who have been apnea free for at least 8 days are unlikely to have another apnea. Continuation of caffeine therapy at home is not recommended; a similar answer was obtained from the majority of respondents in our study. The evaluation of premature infants who experience persistent apneic events and discharge home on caffeine warrants a very clear plan, close follow-up, multidisciplinary team approach, and providing home oxygen with monitor and proper cardiopulmonary resuscitation training for the parents. Protocols, policies, and guidelines are the frameworks that are used to provide a clear, logical evidence base structure for guidance in clinical management. Our study reveals that 47 out of 78 physicians are following specific unit guidelines for assessment, documentation, and reporting of apnea events, and 51 out of 78 are following specific unit guidelines for caffeine therapy in the management of apnea of prematurity. Thus, not all NICUs have adopted empiric protocols assisting in decision-making process in patient care within this context. Caffeine citrate is one of the core drugs commonly prescribed in the neonatal intensive care units. However, there are still controversies surrounding this drug. This study reviews and highlights differences in current practice. From this point on, we recommend early initiation of caffeine for all preterm infants < 30 weeks of gestation, discontinuation of caffeine therapy to be considered at 34 weeks corrected gestational age provided that patient has been free of apnea. If caffeine therapy restarted for clinical indication, it is recommended to be continued until the preterm infant reached a corrected gestational age of 37 weeks. There is no clear evidence to support the continuation of caffeine therapy at home. Observation period of 5 days before hospital discharge is recommended, although a longer period up to 7 days is advisable for infants born <28 weeks of gestation. There is a considerable variation in the practice regarding caffeine use. In this behalf, individual NICU is encouraged to develop policies and guidelines for apnea of prematurity management, forming the foundation of a national statement to standardize management and maintain a high quality of care. The authors would like to acknowledge the participation of Alaa Kabbani, medical student form Alfaisal University and Ali Alnakhli, medical intern from Alfaisal University in formulating the proposal and collecting the data, and Manal Alshaikh from Pediatric Research Unit in the Department of Pediatrics at KFSH & RC for the support provided to the study. Zhao J, Gonzalez F, Mu D. Apnea of prematurity: From cause to treatment. Eur J Pediatr 2011;170:1097-105. Moriette G, Lescure S, El Ayoubi M, Lopez E. Apnea of prematurity: What's new? Arch Pediatr 2010;17:186-90. Henderson-Smart DJ, Steer P. Methylxanthine treatment for apnea in preterm infants. Cochrane Database Syst Rev 2001;(3):CD000140. Dobson NR, Hunt CE. Pharmacology review: Caffeine use in neonates: Indications, pharmacokinetics, clinical effects, outcomes. NeoRev 2013;14:e540-e550. Murat I, Moriette G, Blin MC, Couchard M, Flouvat B, De Gamarra E, et al. The efficacy of caffeine in the treatment of recurrent idiopathic apnea in premature infants. J Pediatr 1981;99:984-9. Spitzer AR. Evidence-based methylxanthine use in the NICU. Clin Perinatol 2012;39:137-48. Schmidt B, Roberts RS, Davis P, Doyle LW, Barrington KJ, Ohlsson A, et al. Caffeine therapy for apnea of prematurity. N Engl J Med 2006;354:2112-21. Schmidt B, Roberts RS, Davis P, Doyle LW, Barrington KJ, Ohlsson A, et al. Long-term effects of caffeine therapy for apnea of prematurity. N Engl J Med 2007;357:1893-902. Schmidt B, Anderson PJ, Doyle LW, Dewey D, Grunau RE, Asztalos EV, et al. Survival without disability to age 5 years after neonatal caffeine therapy for apnea of prematurity. JAMA 2012;307:275-82. Schmidt B, Roberts RS, Anderson PJ, Asztalos EV, Costantini L, Davis PG, et al. Academic performance, motor function, and behavior 11 years after neonatal caffeine citrate therapy for apnea of prematurity: An 11-year follow-up of the CAP randomized clinical trial. JAMA Pediatr 2017;171:564-72. Eichenwald EC; Committee on Fetus and Newborn, American Academy of Pediatrics. Apnea of prematurity 2016;137:1-7. Ramesh P, Samuels M. Are methylxanthines effective in preventing or reducing apnoeic spells in infants with bronchiolitis? Arch Dis Child 2005;90:321-2. Abdel-Hady H, Nasef N, Shabaan AE, Nour I. Caffeine therapy in preterm infants. World J Clin Pediatr 2015;4:81-93. Henderson-Smart DJ, Steer PA. Caffeine versus theophylline for apnea in preterm infants. Cochrane Database Syst Rev 2010;(1):CD000273. Gal P. Caffeine therapeutic drug monitoring is necessary and cost-effective. J Pediatr Pharmacol Ther 2007;12:212-5. 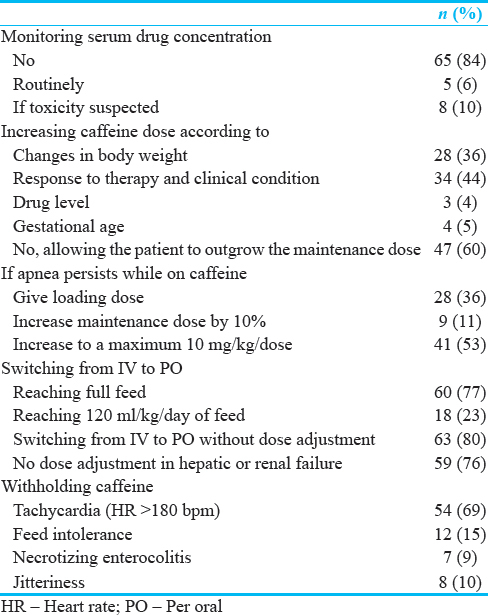 Francart SJ, Allen MK, Stegall-Zanation J. Apnea of prematurity: Caffeine dose optimization. J Pediatr Pharmacol Ther 2013;18:45-52. Picone S, Bedetta M, Paolillo P. Caffeine citrate: When and for how long. A literature review. J Matern Fetal Neonatal Med 2012;25 Suppl 3:11-4. Lorch SA, Srinivasan L, Escobar GJ. Epidemiology of apnea and bradycardia resolution in premature infants. Pediatrics 2011;128:e366-73. Picone S, Aufieri R, Paolillo P. Apnea of prematurity: Challenges and solutions. Res Rep Neonatol 2014;4:101-9. Rhein LM, Dobson NR, Darnall RA, Corwin MJ, Heeren TC, Poets CF, et al. Effects of caffeine on intermittent hypoxia in infants born prematurely: A randomized clinical trial. JAMA Pediatr 2014;168:250-7. Eichenwald EC, Blackwell M, Lloyd JS, Tran T, Wilker RE, Richardson DK, et al. Inter-neonatal Intensive Care Unit variation in discharge timing: Influence of apnea and feeding management. Pediatrics 2001;108:928-33. Doyle J, Davidson D, Katz S, Varela M, Demeglio D, DeCristofaro J, et al. Apnea of prematurity and caffeine pharmacokinetics: Potential impact on hospital discharge. J Perinatol 2016;36:141-4. Eichenwald EC, Zupancic JA, Mao WY, Richardson DK, McCormick MC, Escobar GJ, et al. Variation in diagnosis of apnea in moderately preterm infants predicts length of stay. Pediatrics 2011;127:e53-8. Darnall RA, Kattwinkel J, Nattie C, Robinson M. Margin of safety for discharge after apnea in preterm infants. Pediatrics 1997;100:795-801.